In November 2012, Subsea 7 Norway AS signed the largest SURF EPSCIC contract awarded on the Norwegian Continental Shelf with Total E&P Norge AS valued to approximately 800M USD. Part of the overall scope was to design, manufacture, install, protect and commission the world longest HVAC Power From Shore cable. After more than 2 years of engineering, 14 months of production and one full year of an extensive testing program, the PFS cable was ready for installation Q1-2015, all according to original project plan. In November 2012, Subsea 7 Norway AS signed the largest SURF EPSCIC contract awarded on the Norwegian Continental Shelf with Total E&P Norge AS valued to approximately 800M USD. Part of the overall scope was to design, manufacture, install, protect and commission the world longest (163km) HVAC Power From Shore (PFS) cable, rated to 145kV with an integrated fiber optic system. Due to both length and weight limits for the cable, it has been manufactured in two sections with a dry midline splice connecting the two sections offshore. The PFS cable is connected to the Norwegian main grid at Kollsnes, just South of Bergen in Norway. Here a tunnel was drilled, by using Horizontal Directional Drilling (HDD), from shore with an exit at approximately 30msw to allow for a direct pull-in of the PFS cable. The PFS cable is single source to transmit power from shore to operate the new Martin Linge platform. From the new Martin Linge platform there will also be a combined electrical and fibre cable connecting the new Floating Storage Offloading (FSO) vessel to this main power. Due to the single energy transmitting source, end customer Total E&P Norge has had very high focus on robust cable design, quality and verification testing during manufacturing together with route design and final cable protection requirements throughout planning and project execution phases. At very early stages after contract award from Total E&P Norge, Subsea 7 entered into a formal agreement with ABB in Karlskrona, Sweden for PFS and FSO cables design, manufacturing and installation. ABB further subcontracted the PFS cable installation work scope to EMAS, located in Oslo, Norway with the dedicated cable installation vessel Lewek Connector. EMAS was also responsible for the onshore pull-in scope at Kollsnes. ABB also subcontracted the pre-lay survey work scope (including debris removal) to Swire, located in Bergen, Norway and the work scope was executed with the Seabed Worker. 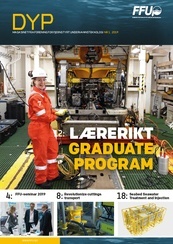 All preparations to allow for the direct PFS cable pull-in at Kollsnes were subcontracted to NCC Sjøentrepenøren located in Bergen, Norway and executed with the Dive Support Barge, Mjø II. Cable trenching and survey scope to Canyon offshore located in Aberdeen- Scotland, executed with the T1500 onboard the Deep Cygnus. Rock installation scope to Van Oord located in Rotterdam- Holland, mainly executed with the Nordnes. The PFS 3 core power cable is 180mm in outer diameter, contains double armor and 3 bundles of 36 optical fibers each. The fibres are mainly used for communication and remote control of the platform from a new dedicated Onshore Operations Center built next to the existing Total E&P Norge offices in Dusavik, Stavanger. Some of the fibres are also dedicated for temperature monitoring at both ends of the cable. Due to the overall length and weight of the cable (approximately 11.000Te), the cable was installed in two campaigns with a dedicated dry midline splice performed offshore. A dedicated “clean room” was developed for both the Lewek Connector and Kollsnes in order to control the environmental conditions and meet Total E&P Norge’s project requirements. Route design, installation and protection of the shallow water section of the route has been very challenging due to seabed topography with rock outcrops, steep gradients and also existing cables and pipelines to be avoided. The route further crosses the Norwegian trench with a maximum water depth of approximately 380m before reaching the Martin Linge platform. After more than 2 years of engineering, 14 months of production and one full year of an extensive testing program, the PFS cable was ready for installation Q1-2015, all according to original project plan. The Lewek Connector commenced cable loadout from Karlskrona April 2nd 2015 for the first cable section of approximately 82km. 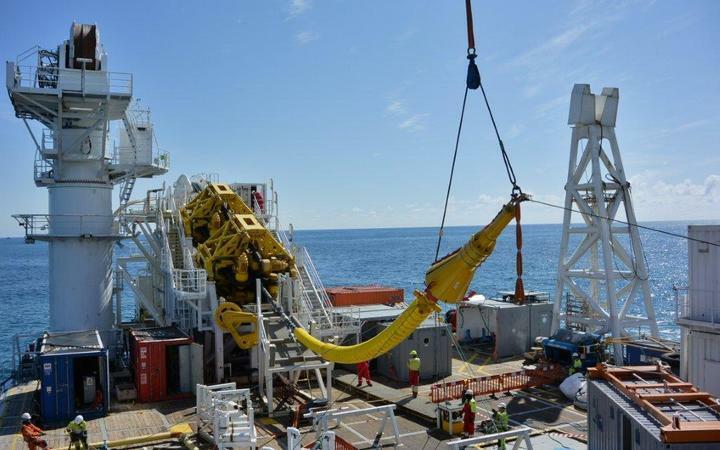 During the coming two months, the world longest subsea high voltage AC cable was successfully installed by the Lewek Connector, including the midline splice and 23 crossings. The PFS cable was finally tested and laid down in the dedicated pull-in configuration at 15:09hrs on Sunday the 31st May 2015. The PFS cable was then fully protected by jet trenching and rock installation in the months of June and July 2015. 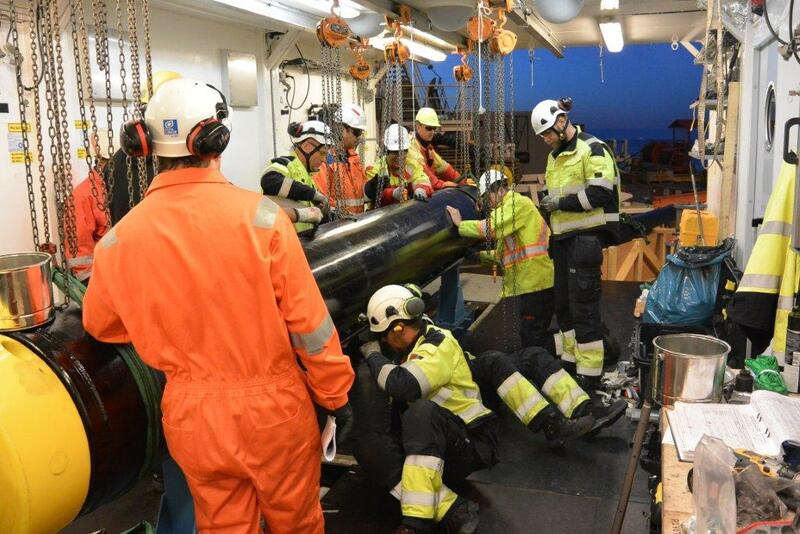 A final integrity test program was performed from Kollsnes prior to formal handover of the cable from Subsea 7 to Total E&P Norge. 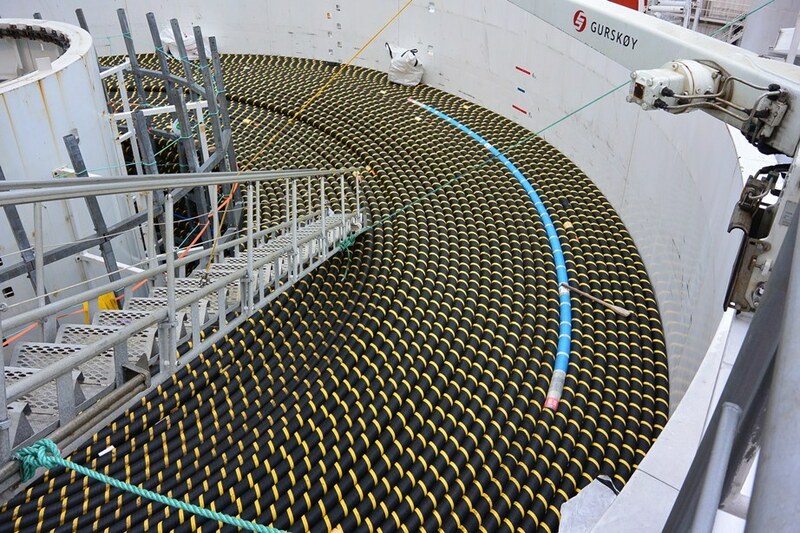 The PFS cable end is currently planned to be pulled in and connected to the Martin Linge platform when installed. Subsea 7 wants to highlight that all operations have been completed with a high degree of professionalism and excellent HSE performance. Collaboration is definitely the one key word which is also worth mentioning in such a complex contractual arrangement involving stakeholders from many different countries and industries. Collaboration has been an essential element in ensuring the great success of interface management such as at Kollsnes (cable onshore connection to the new dedicated Total E&P Norge power substation).